well..........Squads were formed on the basis of complementary fighting styles au skill sets. 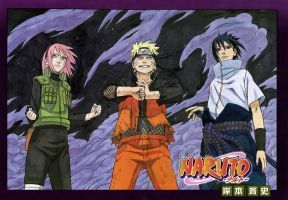 naruto's squad was formed kwa adding in Saske (to balance the immensely powerful but relatively unskilled Naruto) and Sakura was brought in because she was highly intelligent and there was a romantic pembetatu angle in the trio that would encourage all of them to excel (in an attempt to gain the attention of the object of their affection). The 2:1 ratio was not uncommon, but was not universal, either. It's likely that the ratio of Ninja in leaf village (and possibly others) was close to 2:1, as well - if this is the case, it would nicely account for the large number of teams which respected the ratio. 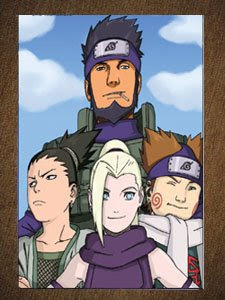 For example: In the Leaf Village, once a ninja initiate became able to take on missions, usually at the rank of Genin, they were assigned to a squad of three with a Jounin-level leader to provide guidance, coordination and experience to the other members of the team. Personalities would occasionally be considered for mission compatibility depending on the nature of the mission au the shinobi. In the event of a team needing backup, a sekunde group of three Genin plus one Jounin would be assigned to support. ANBU Black Ops traveled in groups of 4 to 8 members depending on their mission. This allowed for strength, reconnaissance and redundancy always ensuring a member of the team could return nyumbani with information gathered from their stealth operations. In such teams, the members were chosen, not for their sexual orientation but for the compatibility of their styles of fighting au the compatibility of their techniques. This compatibility was looked at while they were still members of the Academy and promoted to ensure teamwork and coordination as they grew in power and skill. If wewe were a member of the Akatsuki, one of the show's major villain groups, wewe would be traveling in teams of two, chosen for jutsu compatibility. Personality was far less likely to be a factor in your relationship with your partner. Your partner would likely have shinobi jutsu techniques that were able to be utilized in a fashion that the two of wewe were a force to be reckoned with even against other elite shinobi. Each of the trios we see from the Leaf Village tried to mix, reconnaissance, stealth, fighting prowess and healing ability in all of their groups. The Leaf village was also fortunate in having a relatively high number of elite and specialist ninja they could call upon. Other villages were not as fortunate, as many of their members where killed when the Great Beasts (Jinchuuriki) roamed the land before they were sealed away au destroyed. Later warfare would take a toll on many village shinobi reducing their numbers further.